The Intel SSD DC S4500 series enables data centers to optimize legacy infrastructures while enabling their business growth. It reduces cost with infrastructure compatibility. It increases server efficiency and improves data reliability. The Intel SSD DC S4500 series are built for compatibility in legacy infrastructures with a SATA interface that enables easy storage upgrades for your data center. 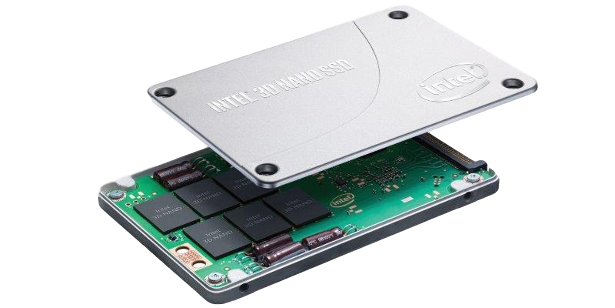 These latest generation enterprise-grade SSD’s reduce power demand and cooling requirements by up to 3.2x. Based on TLC Intel® 3D NAND technology, the SSD DC S4500 series offer a variety of capacities, from 240GB up to 4TB, in a standard 2.5-inch form factor. With larger capacities, data centers can significantly increase data stored per rack unit versus standard 2.5-inch, 2TB HDDs. With a 3.2x lower Annualized Failure Rate (AFR) compared to HDD’s, your IT department will spend less time and expenses replacing, or upgrading, storage devices. Intel SATA SSD’s install seamlessly so you can reduce risk of component failures. Equally important, once the SSDs are installed, the innovative SATA firmware completes updates without reset and therewith reduces downtime. Feel free to contact us here and send us an email with your inquiry or give us a call and ask for the latest pricing available!